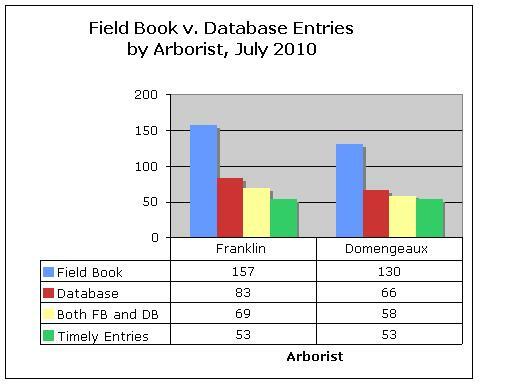 The field book is a daily record of all the inspections conducted by the city arborist (blue bar). All field book notes should be entered into the City's database (red bar). The database record should match what was recorded in the field book (yellow bar). Field book notes should be entered into the database within one working day of the field inspection (green bar). Need help in understanding what's wrong? Read our latest investigative report, "Double Trouble", to find out. None of this is new news. We've been reporting since September 20 that fraudulent work reports are being submitted in the Arborist Division. On October 6, Commissioner James Shelby promised The Tree Next Door, in a meeting with his manager, COO Peter Aman, to investigate the matter. To date, the City has yet to respond in any meaningful way. Now we are learning that our claims of fraud extend to an additional arborist in the same division, and herein lies double-trouble. When the City's Arborist Division has only three field arborists in total, a 2 out of 3 fail rate ain't bad, it's really bad. Many mandatory Standards of Practice of the Arborist Division are being breached by these two arborists. And their manager, Ainsley Caldwell, is in clear violation of Article 33 of the Department Standards of Conduct, which states that "Supervisory employees shall enforce the policies, procedures, rules and regulations of the department and the City of Atlanta". Furthermore, Caldwell's superiors - James Shelby and Peter Aman -- are also in violation of Article 33 if they continue to fail to act when they have knowledge that this activity is happening on their watch. Not only are the field arborists not being held accountable, but their manager is not being held accountable, nor is the head of the bureau that oversees them, or the commissioner above them, and so on up the chain. The buck, of course, eventually stops with Mayor Kasim Reed, who shortly after his 2009 election asserted, "I'm not afraid to fire people. If people do not meet the expectations I set and the citizens of Atlanta deserve, they will be fired." But here we sit at the end of 2010, and it's still "business as usual" in the Arborist Division.